Will China Deploy Troops to Syria? Kim, however, refrained from talking about reports on North Korea’s nuclear weapons and long-range missiles, the Associated Press reported. His speech was broadcast on North Korea’s state television, according to AP. The North’s leader said that his country was willing to have a candid dialogue with its neighbor and urged South Korea to respect an inter-Korean agreement reached in August to simmer military tension. 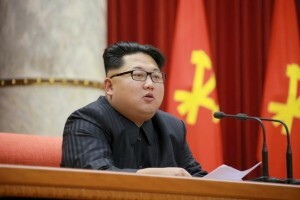 Analysts reportedly examined Kim’s comments for hints about the country’s goals for the coming year. “We are willing to have talks in an open-minded manner with anyone who wants peace and unification,” Kim said, according to Yonhap News agency. “South Korea should honor the spirit of the inter-Korean agreement in August. Seoul should refrain from doing acts that hurt the conciliatory mood,” he added. Pyongyang and Seoul reached an agreement on Aug. 25 to ease military tensions between the two states after a land mine blast near the inter-Korean border was blamed on North Korea. Under the agreement, the two Koreas held high-level talks in December 2015, but the meeting concluded without any settlement. On Dec. 29, 2015, Kim’s top aide Kim Yang Gon, who was tasked with managing strained relations with South Korea, died in a car crash, prompting experts to warn that it might further complicate ties between the nations.